This one active the Stroke. 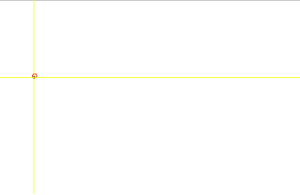 If you click on, you a pop-up menu will appear and you could choose Dot, One point Dot and Filled stroke. This last tool is a filling tool. It will be explained later in that lesson, with other filling tools. This one active the Line. 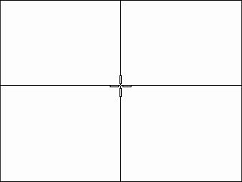 Hold [Shift] to draw a perfect straight line. This shortcut works with Lines, Dot and Stroke. By the way, if you hold the click on the Line's icon, you will have the possibility to use the tool Fill line. As a filling tool, its parameters will be explained later in that lesson, with other filling tools. 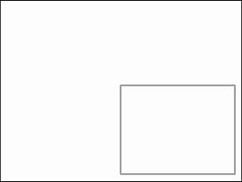 To draw a Rectangle, click on the center of the image and, without letting go of the mouse button, slide it towards the bottom right hand corner. Release the mouse button. 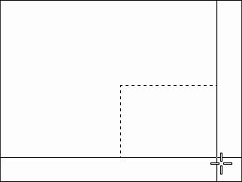 A gray rectangle has now been drawn in the current project window (see diagrams below). 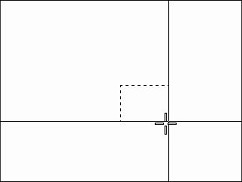 Hold [Shift] to draw a square instead of a rectangle. This icon is used to draw Ellipse. On the drawing space, click on the ellipse's center, then hold the click until you obtain the wished ellipse. Press [Shift] if you want to obtain a perfect circle. If you click on that icon, you could choose different circle modes, such as 2 pts circle and 3 pts circle. 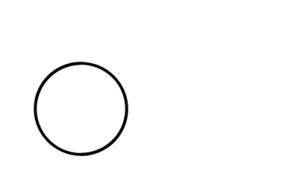 The first one creates a circle by defining its diameter. The second one creates a circle by defining a diameter and a rotation angle. This icon will give you an access to different Splines. By default, you can draw 3 points splines, but you can also draw multiple points splines, such as Beziers splines and B-Spline splines. click again, once you are satisfied of your spline. When using the B-Spline or Beziers spline, hold [Shift + Suppr] to delete the last placed points. 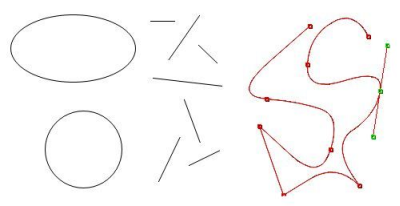 To draw a multiple points spline in your drawing space, click several times with your mouse or stylus to build a line broken by yellow lines or punctuated with red dots. These both tools are very useful, because you can modify dots or lines. * for more precision, press [Ctrl] to move only one handle in the tangent. *press [Ctrl] and click anywhere on your drawing space to move your spline. * You can also close the spline thanks to the option Close Spline in the pop-up menu, that will appear if your right click. * Then, always thanks to that pop-up menu, you can Apply Spline. You can also use the key [Enter]. * The option Add to bin saves the current spline, in order to use it later (the software will ask you a name to save the spline). To re-use a spline, open the pop-up menu and choose it among the different names proposed at the bottom. The pop-up menu can appear only if you started to draw another spline. You can also delete a spline via the Erase menu. The aspect of circles, rectangles, splines... that you obtain depends on the current tool : mechanical pen, pen brush, airbrush, crayon... (see below). Please note if you want to use parameters of the current brush, use Fade connection. Connection will be discussed on lesson 10.